This entry was posted on Saturday, June 27th, 2009 at 10:18 pm	and is filed under . You can follow any responses to this entry through the RSS 2.0 feed. You can skip to the end and leave a response. Pinging is currently not allowed. I remember seeing Michael, Mac Culkin and his brother, slide down this in 1990. It was bright yellow, shiny and clean. It’s so sad to see it in this condition and unused. Where has our ‘love’ gone? This entire gallery of photos, while beautiful, was very painful to view, as it now feels like a journey through a cemetery, where Michael’s soul is in every statue, every colorful carousel, every attraction. Even the iconic Neverland clock, which was so magical when Michael lived here, now stands frozen in time and reflects the darkness of its tragic surroundings. It is taking all the strength I have to keep from collapsing from the devastation of what a venomous media and ignorant “sheep-like” public have done to this gifted, generous and INNOCENT man! 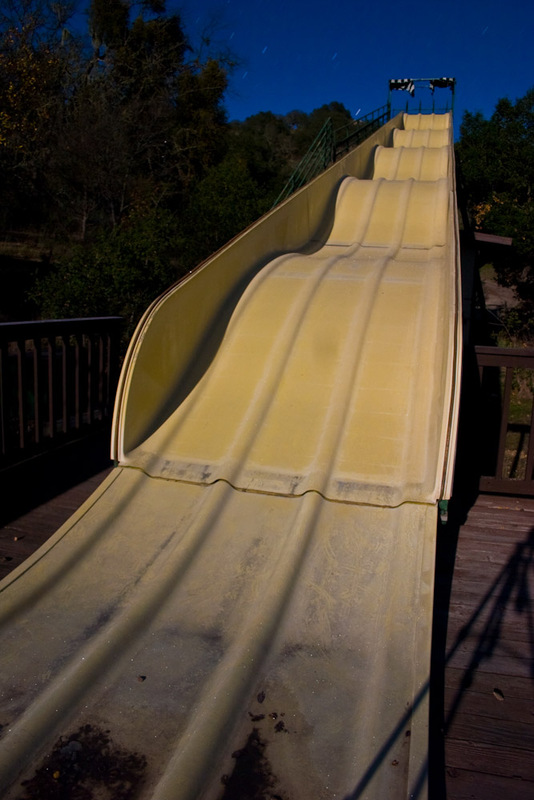 Among all the brilliantly colored photos in this gallery, this eerie image of the giant slide with its dingy and neglected condition comes alive for me in all its glory, and also makes my heart sink. In a familiar home video Michael had the time of life one sunny afternoon with Macaulay Culkin and another young friend, reveling in a moment of sheer boyhood fun as the three of them raced each other happily down that slide. Nothing Michael could buy would ever have compared to that moment of innocent abandon. And no other photo does as much for my senses in terms of what Michael was all about, and the precious life we have lost. Michael built his beloved Neverland home from the childhood spirit and pure goodness that lived in his heart, and he derived most of his joy through sharing it with “children of all ages” from four to eight-four. What a tragic hypocrisy that Michael could invite celebrity friends like Elizabeth Taylor and Gregory Peck frequently to Neverland – to be a kid for a few days and experience the lost joy of such childhood fantasy – yet, be so vilified and persecuted for having opened his home and his heart to the hundreds of sick and disadvantaged children, who never experienced such joy, and for whom Neverland was primarily conceived! Because of society’s jaded view of the harsher realities of their own world, they refused to accept that a grown man could possess an innocent heart and pure soul. It’s an ignorance that destroyed one of the greatest human beings the world has ever known. Michael Jackson was a gift from God, and his legacy will be far reaching and eternal. Micheline could not have said it any better. RIP Dear Michael. Out of all the pictures this one makes me the saddest. I also watched the video of Michael and Macaulay sliding down this slide and having so much fun on it just a few hours ago. Now it just looks so lonely and unused. Thank you for posting these pictures.